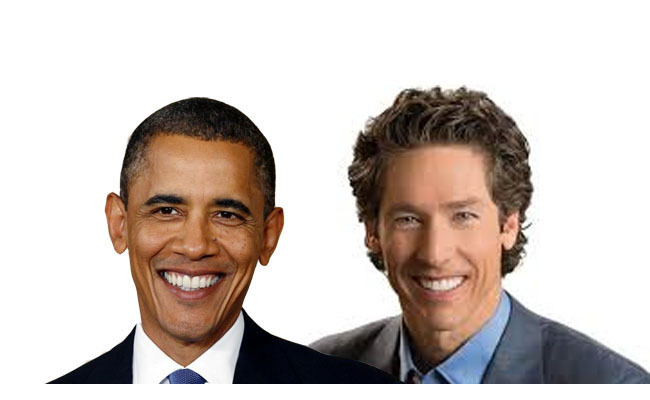 What do Barack Obama and Joel Osteen have in common…with George W. Bush? Maybe the better question to many of us would be to ask what they don’t have in common. After all, for those of us with a biblical worldview and the naturally following conservative political bent, we tend to view these men in a very similar light. We don’t care for either character very much and we tend to have an easy time seeing and explaining why. Or so we think. They are both charismatic. They are both well groomed. They are both excellent marketers. They are both wildly popular with “their people”. And they are both loaded to the brim with really bad ideas – ideas that are foundational and destructive in application. These similarities might stand out quickly to those considering the question of shared attributes between misters Obama and Osteen. Even so, what I’m aiming for here is the bigger shared attribute; the more important commonality between these two culture-shaping men of the moment. In their roles as fundamentally blind, ignorant purveyors of worldviews that are openly at war with the truth of Scripture, there is a much higher (or lower, depending on how you want to tackle this) way in which these two are connected: They are both physical, personal manifestations of the wrath of God upon a people. These two personify the wrath of God upon those who follow them. I can’t remember who it was that I heard say it (I think it was Paul Washer), but when addressing the nature of the relationship between Joel Osteen and the faithful fan base attending his mega-mega-mega-church down in Houston (yes, it still fits), a very useful and important correction was made. When someone asked how long it would be before God would judge those following Osteen, the speaker said that Joel Osteen was the judgment of God upon those people. God is giving those people what they want, and He’s doing it through Joel Osteen. They want a false gospel of prosperity and self-centeredness, and He has given them over to it, with Joel Osteen there to lead the way deeper and deeper into judgment. This is my paraphrase of what was said, anyway. I thought it was a very insightful observation, and it fits in well with what I am trying to share here. The people who go to a Joel Osteen and love the teachings of a Joel Osteen are, generally, dead to truth. They are slaves to sin. Until and unless they repent, believe, and are supernaturally transformed into New Creatures in Christ through His Gospel, they will continue to rebel and love the sin through which they express that rebellion. They will love doing it their way. They will love worldly, man-centered teaching. And they will flock to leaders and teachers who bring them what their “itching ears want to hear”. The people who follow Barack Obama are in the same sort of camp. Their worldview is founded on the supremacy of man and rejection of the Nature of Christ as revealed in His Word as the binding, authoritative standard in every realm of life right here and now. While many in both Camp Obama and Camp Osteen claim to love the Lord, they love themselves and hate the Lordship of Christ the King in practice. They like their gospel man-centered, self-serving, and sequestered from any realm of life that they will not surrender to the Lordship of Christ. And man, do we ever love to beat up on ’em for it! The likes of Barack Obama and Joel Osteen are easy, fun targets for us. They’re like our favorite piñatas. We have no trouble whatsoever applying Scripture to the decimation of these guys and their causes. Their open rejection of so many core truths of Scripture are so plain, flagrant, and obvious to us that we eagerly join in the piñata pummeling mob. The anti-Christian nature of the worldviews advanced by Barack Obama and Joel Osteen get us all fired up and ready to proclaim the Lordship of Christ in response to their proclamation of the lordship of man. And that is a good thing, generally speaking. Our application needs some polish and improvement, to be sure, but the general principle of standing clearly and boldly against the enemies of Christ the King is a very, very good and beautiful thing. And it leads us nicely to the third party in consideration here: George W. Bush. First off, let me say that President Bush seems like a very nice guy. Then again, so does Joel Osteen. This seems like a good spot to mention and try to apply the important concept of consistency. Consistency is an essential component of a sound worldview. Conversely, inconsistency is the first sign of a flawed and broken worldview. With that little rabbit appropriately chased down, let’s return to the consistent application of a Christian worldview to the natures of Barack Obama, Joel Osteen, and George W. Bush as leaders of men and shapers of culture. Again, President Bush seems like a very nice guy and I am not about to nitpick on small, periphery things or imagine that I will be able to cover every important detail about who he is in the context of this question. I’m also not making any claims to know his state of salvation in the ultimate sense. I have no power to do that with Mr. Bush, Mr. Obama, Mr. Osteen, or anyone else. What I am aiming for here is to point out a handful of important, foundational truths regarding President Bush in a way that will reveal whether or not he holds and advocates a worldview that is coherent with biblical Christianity as defined by Scripture; whether he proclaims the Lordship of Christ by way of his policies and politics, or whether, at the end of the day, he shares the same basic man-centered, worldly, anti-Christian foundation as Barack Obama and Joel Osteen. George W. Bush has repeatedly described Islam as “a religion of peace” and Allah as being basically the same god as God. Barrack Obama clearly shares this sentiment and Joel Osteen has demonstrated similar inclinations against defending (or even understanding) the exclusivity of Christianity and the exclusive nature of Christ as the true and reigning King of creation. George W. Bush believes firmly in the power and growth of the State. The purposeful era of perpetual war abroad and the NSA/TSA surveillance state at home – all fueled by the mass production of Monopoly money, which itself is an abomination to God (see: Proverbs 11:1) – was kicked into high gear by the Orwellian “Patriot Act” and related programs initiated by President Bush and built upon by President Obama. This is but one gigantic example of a great many actions taken by President Bush to grow the power of the State, promote the dependency of the people, and utterly dismiss the Word of God as a binding standard for any issue impacted along the way. George W. Bush is fundamentally opposed to the biblical definitions, responsibilities, and limitations provided by God with regard to the family, church and state. This again is a foundational truth that he shares with Barack Obama. Forget what Mr. Bush says. Examine what he does. (You know, like you have no trouble doing with President Obama.) Our State-controlled children’s “education” system is straight out of the Communist Manifesto, yet “leaders” like President Bush have been used mightily to redefine, repackage, promote and then cement such core Communist concepts as State controlled children’s education as somehow “conservative” and “all American” in the minds of those whom he has successfully led away from truth by leading them away from Christ as the defining light of all things, including conservatism, patriotism, education, and economics. George W. Bush predictably serves Corpo-Fascist globalist interests right on down the line and at nearly every opportunity, from economics and privacy matters to centralized economics and State-controlled children’s education…all while claiming to his enabling fan base to be a pro-American Christian. (However they want to define those terms…which doesn’t really matter anyway as long as it keeps working, right?) Does Barack Obama not do the same? George W. Bush is personally and politically committed to promoting a “conservatism” that looks a whole lot like good ol’ fashioned Statism, Socialism, and Fascism. Our centralized control of a Monopoly money-fueled economic system in the hands of a few to create or have access to “money” made out of thin air gives those people the power to control all others, and is the death of true free market capitalism and the work ethic. Yes, big businesses can and will thrive, but “too big to fail” businesses and banks are one tell-tale sign that the economic system championed and advanced by George W. Bush (and Barack Obama) is wildly unbiblical and utterly incompatible with the free market, level-playing field “conservatism” that he and the Republican Party routinely pitch from their lips. George W. Bush is an effective leader of people…away from Christ. Whether he knows it or not or understands it or not, the fact remains that through his true worldview in action, as demonstrated through his public pronouncements and policies, George W. Bush consistently leads those who would follow him away from Christ. Christ the King has spoken on economics, politics, warfare, and children’s education…and President Bush, like President Obama, regularly leads people away from those perfect, sufficient, life-giving words from the King of creation, and further into the darkness of man-centered tyranny and Statism. 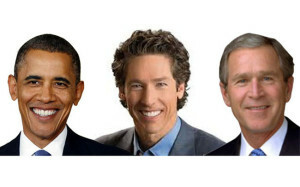 So it is that Barack Obama, Joel Osteen, and George W. Bush really do have a lot in common. And that’s the point. Hard but true, as clearly as I can see or share it at the moment, anyway. What do Barack #Obama and Joel #Osteen have in common…with George W. #Bush? A lot more than you might think. Why do I write these hard but true things? Why do I feel compelled to share these thoughts in this way? Because I love the Lord, America, George W. Bush, Barack Obama, Joel Osteen, and you, the reader. Because I desire repentance and restoration for America and all therein, one individual supernatural act of salvation by the grace of God at a time, and I know that such restoration is not at all promoted by pretending that lies are truth or that evil is good. Because I am tired of seeing man-centered perversions of patriotism, conservatism, and political ideology divorced from Christianity and used as weapons to beat obedient Christians into submission, or “getting with the program” of the world. And because I want my children and their children to actually have the opportunity to thrive in the ways that can only be provided by Christ-centered freedom, liberty, economics, and education. I know that a Christ-dismissing approached to any of these realms will always ultimately lead to their corruption and death…which is pretty much where the likes of Obama/Osteen/Bush have led us , is it not? If the original question at the beginning of this sent you into such an emotional tizzy that you are now regretting having ever begun reading this and cannot believe that anyone would even suggest such possibilities about George W. Bush, when maybe “What do Barack Obama and Joel Osteen have in common with George W. Bush?” isn’t the most appropriate question for you to be considering. Maybe the better question for you is: How much do you have in common with the typical follower of Barack Obama or Joel Osteen when it comes to blind loyalty (also known as idolatry)? So is the Christ-dismissing, Great Commission-opposing “leadership” of George W. Bush part of the judgment of God upon us? Don’t get mad at me for asking. I only do it ’cause I love you, America, and George W. Bush…as Christ defines love. Why Americans don’t do repentance. So the American State has to destroy our freedom in order to protect it? Oh yeah, that makes sense. Problem>Reaction>Solution: Why we will beg to have our freedoms taken away and go to war forever.